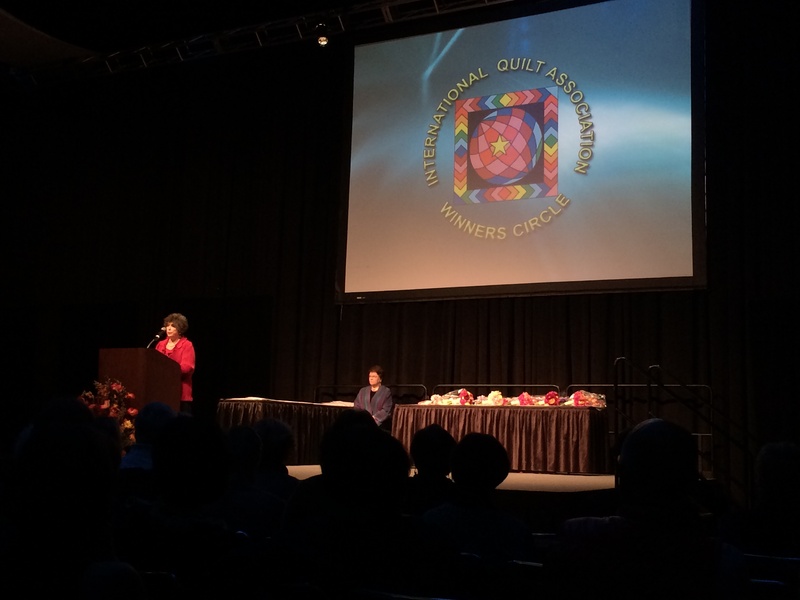 I will try to describe in words and photos my amazing week at the International Quilt Festival in Houston: from the excitement of the Winner’s Circle Event, to attempting (and failing) to see over 1300 quilts on display, to endless aisles of vendors, to spending time with friends and making new ones…it was an extra special week for me. 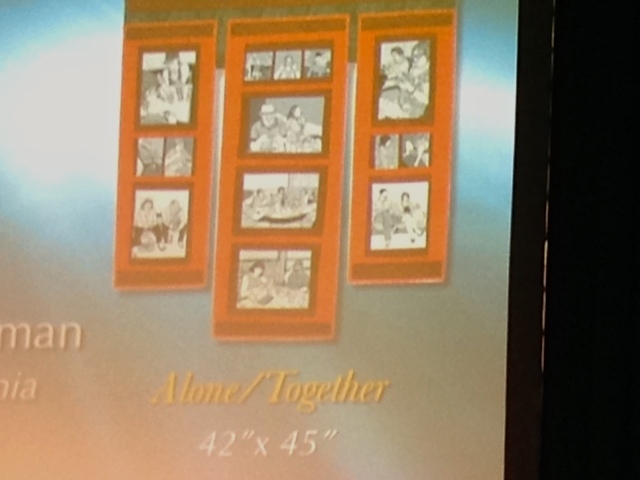 Hearing my name announced as a 2nd Place Winner in the Digital Imagery Category and seeing Alone/Together’s image on giant screen as I walked to receive my award on Tuesday night at the Winner’s Circle Event was AMAZING!! 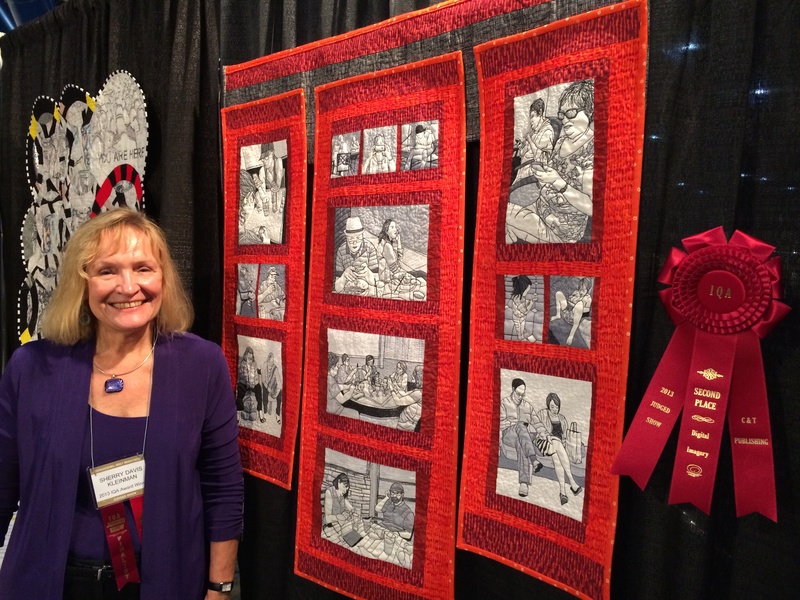 My dear long time college friend Lynda Darnutzer Brownson (traveling from Tulsa for her first venture into the world of quilts) was there with me snapping a photo of my big moment on stage. 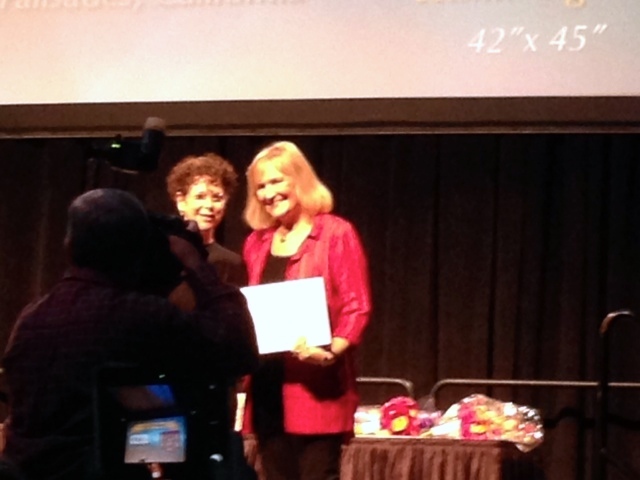 I am accepting my 2nd place award in Digital Imagery from C and T Publishing. Want to be inspired and see more photos of the big night? 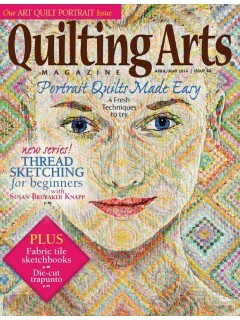 Here is a link to ALL of the Winners announced that night: http://www.quilts.org/winners.html Congratulations to all!! What fun it was to share the night with my friend Lynda. Our friendship goes back to our Washington U college days in St Louis. 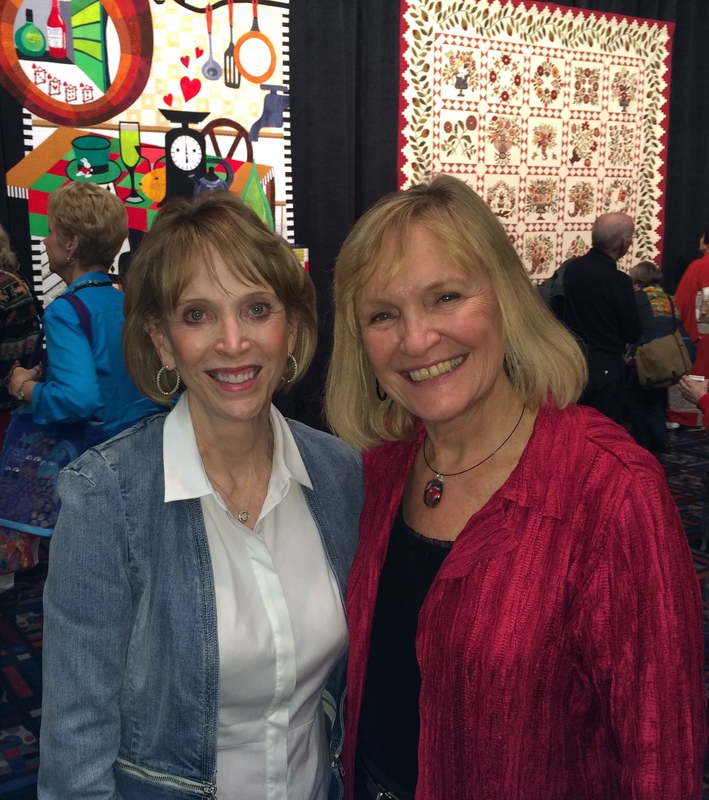 It was her 1st quilt show, nothing like starting off at the biggest one going! She was very impressed and I am sure it won’t be her last. One of the highlights for me was standing by my work talking to those who walked by. I could see their eyes “light up” as they identified with the images on my piece. I sure didn’t create this piece to discourage using cell phones (as I love my iPhone and my iPad.) I just wanted to remind people to TALK to the people they are actually with. Surfing the web, texting, and phone calls can wait until later. My figurative line drawings were drawn with a stylus on my iPad from inspiration photos taken paparazzi style with my iPhone, then printed and stitched on fabric. 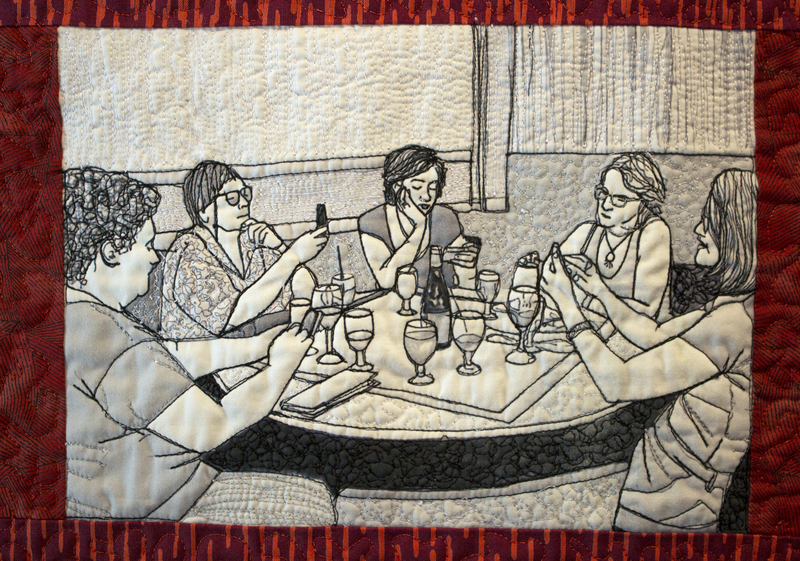 It is ironic that of the many photos that were taken of me with my quilt, most were taken with mobile phones or tablets rather than a traditional camera I kind of wish someone had taken a photo of them taking a photo of me! Stay tuned for my next post with more photos from the show. Love it, dear friend! You look great — and so does your quilt! Many hugs! 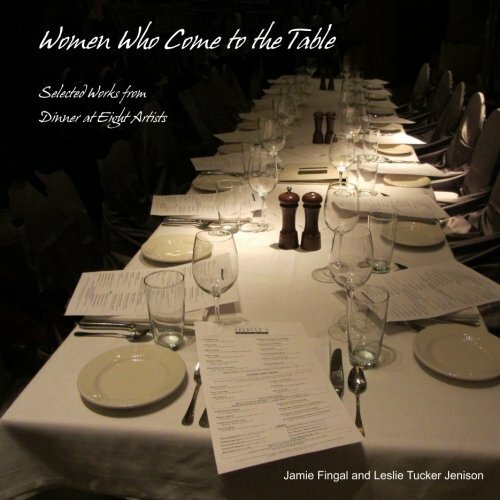 Thanks for your kind words Margaret…and more thanks for your gift! I am so excited for you! I am sure it was an amazing experience. Your works are not only outstanding art but they also SAY SOMETHING that speaks to the viewer. Your award is a testament to their impact and lasting quality.